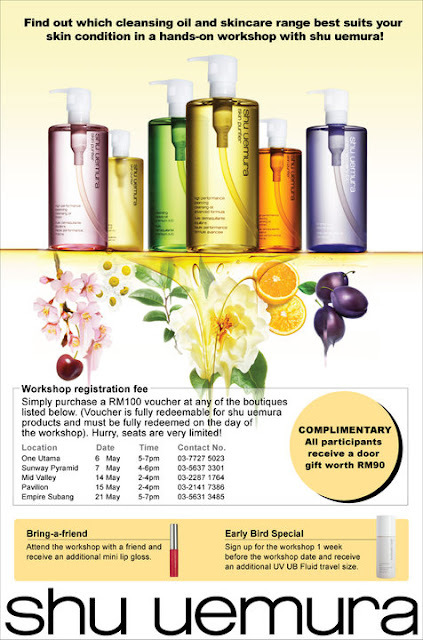 Shu uemura is organizing a Cleansing Oil Workshop. but never experienced it for yourself? Here is your chance! Find the cleansing oil best suited to your skin condition and learn skincare basics in the cleansing oil & skincare workshop! must fully redeem on the workshop day you participate. All participants would receive RM90 worth of door gift. will receive an additional UV UB Fluid Travel size. will get to receive an additional mini lip gloss.